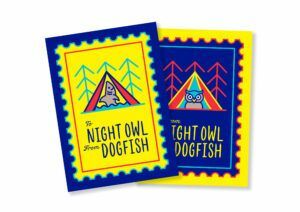 Get your Night Owl Dog Fish postcards – Bounce Sales & Marketing Ltd.
What could be better for this moving, exuberant, laugh-out-loud novel about friendship and family, told entirely in emails and letters than some gorgeous colourful postcards? These will be great to give to your customers and get them excited for this brilliant book. There are two gorgeous designs and come in packs of 10.